Former Air America host Marc Maron demonstrates his world view in skilled fashion on new CD. Comedian Marc Maron raised his profile in 2004 and 2005 as co-host of the morning show on the Air America radio network. His Northeastern neurotic politically liberal point of view was a perfect fit, yet he was inexplicably let go at the end of last year. 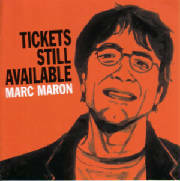 Their loss is stand-up’s gain however, as he returns with a new CD, “Tickets Still Available .” Maron turns his political fire into caustic and inspired pseudo-rants that are carefully constructed underneath all the bluster. Apoplectic at the idea that forwarding e-mail counts as political activism, Maron chalks this up as a status thing -- getting to blow your friends’ minds with something you were first to find. In some ways Maron is a more intellectual version of Dave Attell, at points mining the same absurd territory, as in bits about his retired physician dad’s two-week employment at Wal-Mart, and about alarm clocks disturbing pleasant dreams with scary images. One of the most brilliant bits on Maron’s CD, “Bitter Jesus,” takes on politics and religion all at once, imagining that Christians shouldn’t blame Jews for killing Christ, but rather thank them, because if Christ lived, there might be a third testament in which a 55-year old Jesus embarrasses himself in front of his last apostle, unable to turn water into wine anymore. Within the landscape of the life and worldview of a neurotic New York Jewish comedian, Maron deploys a range of clever well-written material in a way that even those outside this sphere of influence can enjoy. Deep down, Maron’s act isn’t just neuroses, but carefully crafted humor, so well constructed that you don’t see the seams.